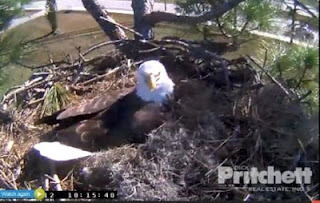 For those of you waiting for our MN/IA eagle cams to be busy, there is one currently on a nest in southwest Florida. The nesting season for eagles in Florida is approximately October - April or May. The camera is 60 feet above the ground, in a slash pine tree. The pair has been at this site since 2008/09, where they raised 2 chicks. For each of the last seasons there has been just one chick. Interesting note for that part of Florida - there are 133 eagle nests in a 25 mile radius.